National Trophy leader Paul Oldham has seen off his fellow British rivals so far this year, but this weekend’s round at Mallory Park could see him away from the head of affairs. “I’m not really looking forward to it at all. I were ill all last weekend. Just got to see what happens, try and get round. I don’t want the curse of Mallory!” he said. Legend has it that whoever holds the leader’s yellow jersey at the Mallory Park round is destined to have a nightmare race and promptly lose it. 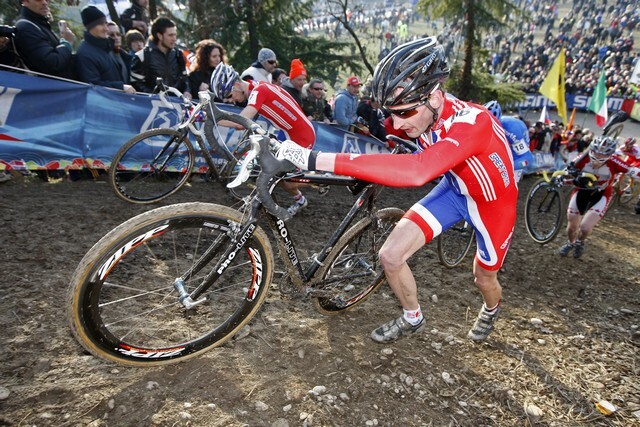 Last year’s leader – and curse sceptic – Ian Field got tangled in the course marking ropes and waved his jersey goodbye. But the Hope Factory racer holds a healthy lead in the series from team-mate Stuart Wearmouth and should be safe – barring disasters. Oldham faces National Champion Jody Crawforth (Arctic-Premier) but not winner of the previous two rounds, Johannes Sickmueller, in what promises to be an extremely muddy hour of racing in Leicestershire. Belgian pro Jan van Dael (Projob), second to Oldham in the opening round, makes the trip across the Channel, as does 2008 Mallory winner Nicholas Bazin (Differdange) of France. Mallory’s famed adverse cambers will be testing in the slippery conditions and course designers have thrown in a tunnel and some short, sharp climbs for good measure. Sunday’s event is supported by the East Midlands Development Agency, who back all three National Trophy races held in the area, plus the East Midlands CiCLE Classic and Lincoln GP.